It would be the 20th November 2014 that I set off on my second run in 14 days. That is pretty much as regular as I had ever been. Sometime during or after that run I decided that I might try and do it a little more often. The run in question was probably more than I was ready for. 2.86km's, very flat but simply too far for someone who had barely ever gone beyond that. It took 21:13 to complete with an average pace of 7:26 per kilometre. The part that highlighted how green I had run was the splits. The first kilometre was 6:53, the second a whopping 8:14, and the last 0.86km averaged 7:08. I had never been good at pacing myself, that was never more evident that this run. At the time I just thought I had knocked up, never thought anything else of it. The middle kilometre saw my legs like lead, I'd have nearly walked that fast, but I came home feeling better for it and with much less soreness than the previous run a fortnight earlier. Something possessed me to try it again the very next day. Again, it was far from the ideal thing to do, but at the time I had no strategy or plans. The result was a lot faster, I put it down to learning my limitations, coping mechanisms, rhythm and, to a very small extent, pace. The time was 19:58 and yet again my splits were all over the place but a lot closer than a day earlier. 6:47, 7:14, 6:48 told me I had still launched into a little hard and was looking for a breather mid-run. I'd pushed pretty hard to squeeze out that last split but was still putting it down to lack of fitness rather than lack of strategy. With it becoming obvious that I had "the running bug", I decided to back up for a shorter run the very next day (November 22). I traversed 1.78km in 11:11, but what stands out about the run is that I had zero concept of pace. 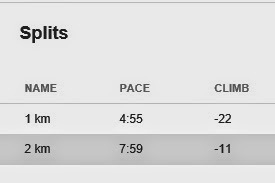 The overall average pace was 6:16 per kilometre yet my individual splits had been 4:55 and 7:59. It was clear that I had gone out like a scalded cat and lugged home like a pack horse. I was still yet to address the problem and was unlikely to improve while I didn't. I embarked on two other runs on the 24th and 25th of November, both 20 minute runs, 10 out 10 back. Both yielded a tick over 3km, the pacing was slightly better but the first split was still abnormally fast in relation to the others. There was a lot to learn in every aspect of what I was doing but I was off and running.